Could a new urban vacation trend take the trees out of treehouses? 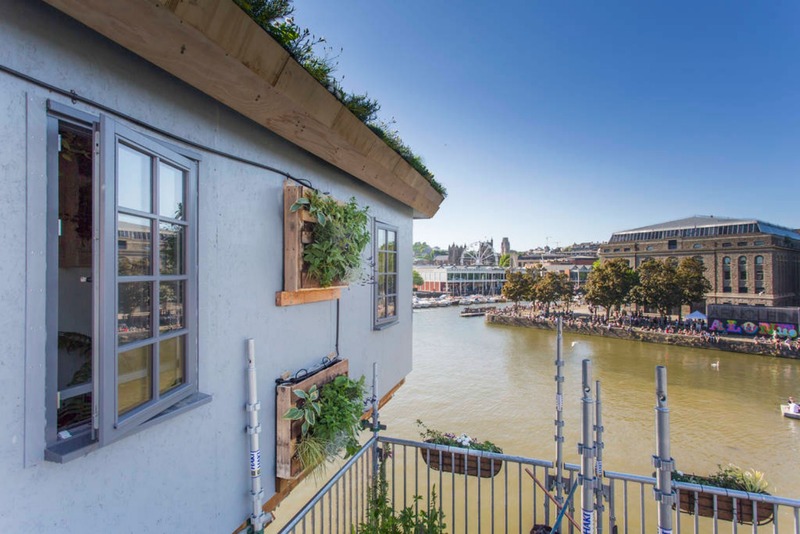 The world’s first “cranehouse” has opened in Bristol and it’s every bit as spectacular as their conventional trunk-supported counterparts. Designed by vacation specialists Canopy & Stars, the tiny structure is hoisted by a cargo crane 26 feet over Bristol Harbor. What’s more, the low-impact wooden structure is completely carbon neutral, and it was built using sustainable materials. 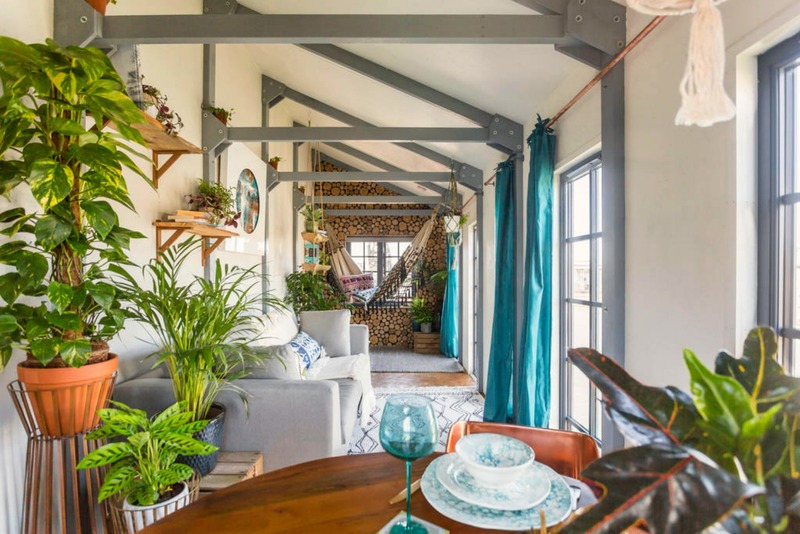 The “hanging basket” is a collaboration between Canopy & Stars and DIY company, B&Q, who decorated the space with a chic collection of sustainable furnishings. Touches of nature are found throughout the space, including walls inlaid with tree branches, a watering can shower, and a bed made out of a reclaimed tree trunk. 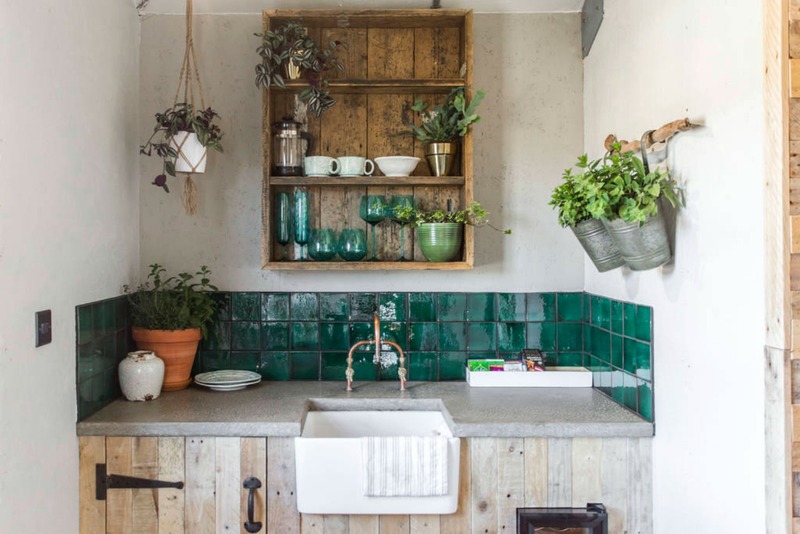 Industrial hints such as copper finials, polished concrete, and natural vegetable-fiber mats complete the rustic, yet sophisticated interior design. Along with a “living painting” by local artist Anthony Garrett, the design focused on creating a similar “multi-sensory experience” one might experience in a true treehouse. Scents of woodlands such as lavender, sage, and bark waft through the interior. Wild flowers are planted in recycled wooden crates on the exterior of the house and various pollinators were planted on the roof to attract bees and butterflies. Guests at Crane 29 will be able to enjoy the beautiful off-grid retreat by spending their time swinging in the indoor hammock and taking in the spectacular panoramic views of the harbor. Reservations, which run £185 a night, include a gourmet breakfast basket delivered to the house in the morning. Crane 29 will only be opened to guests for just 100 days, but all of the profits from the rental space will be donated to the environmental organization, Friends of the Earth. It's a proper noun, so it is spelt 'Harbour'. Could a new vacation trend take the tree out of treehouse? 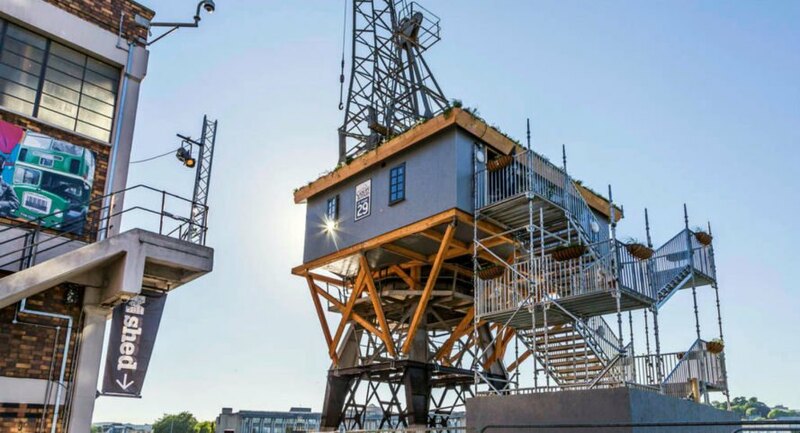 The world's first "cranehouse" has opened in Bristol and it's every bit as spectacular as their conventional trunk-supported counterparts. Designed by vacation specialists, Canopy & Stars, the tiny structure is hoisted by a cargo crane 26 feet over the Bristol Harbor, and what's more, the wooden structure is a low-impact build, completely carbon neutral, and built using sustainable materials. 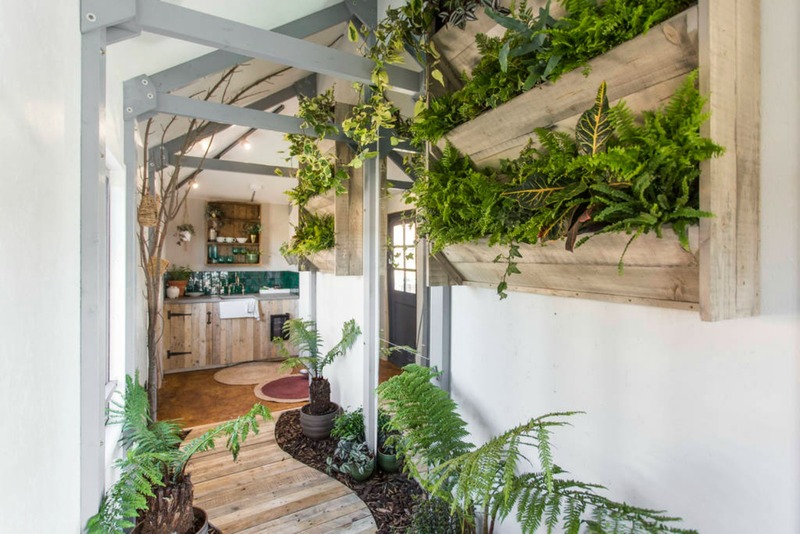 The "hanging basket" is a collaboration between Canopy & Stars and DIY company, B&Q, who decorated the space with a chic collection of sustainable materials. 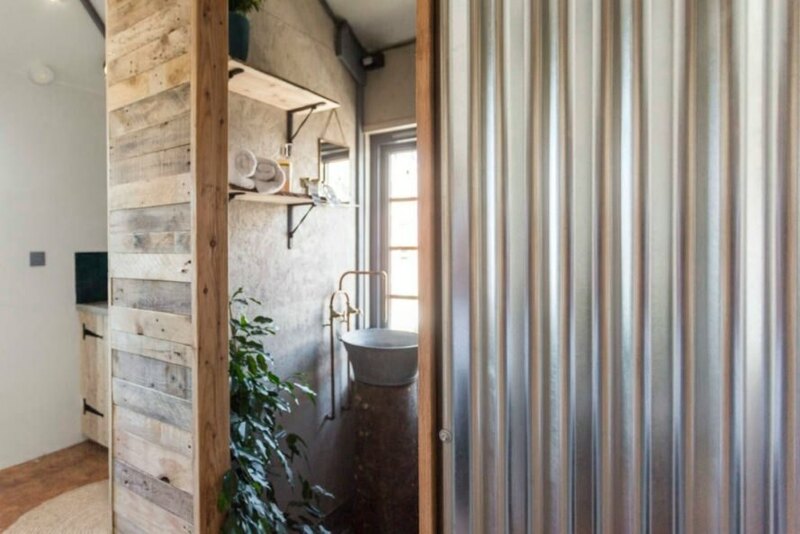 Touches of nature are found throughout the space, including walls inlaid with tree branches, a watering can shower, and a bed made out of a reclaimed tree trunk. 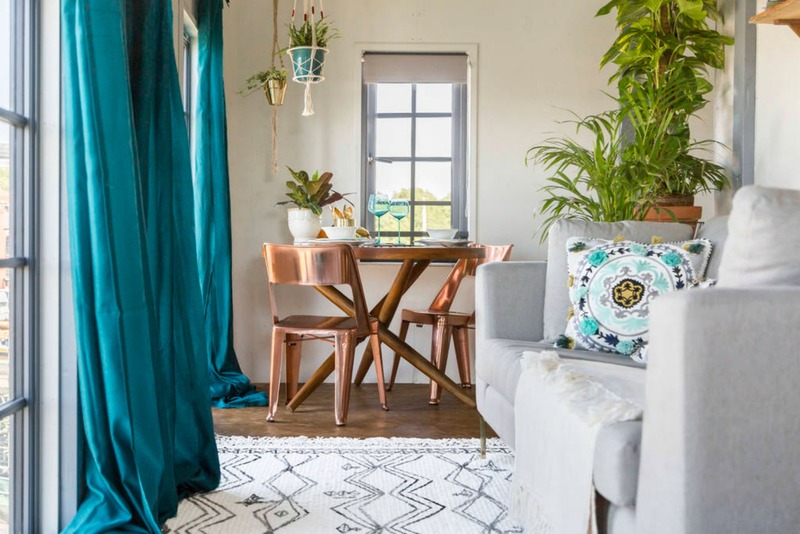 Industrial hints such as copper finials, polished concrete, and natural vegetable-fiber mats complete the rustic, yet sophisticated interior design. Along with a "living painting" by local artist Anthony Garrett, the design focused on creating a similar "multi-sensory experience" one might experience in a true treehouse. Scents of woodlands such as lavender, sage, and bark waft through the interior. Wild flowers are planted in recycled wooden crates and various pollinators were planted on the roof to attract bees and butterflies. Reservations, which run £185 a night, include a gourmet breakfast basket delivered to the house in the morning. 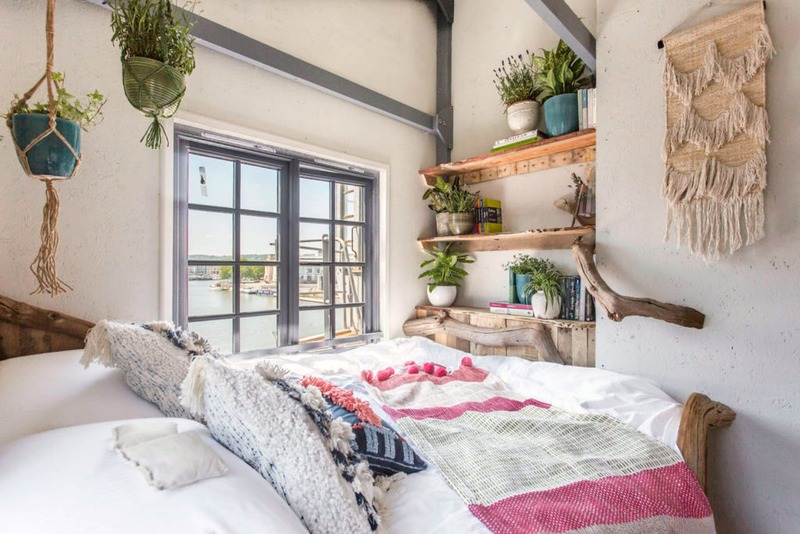 Guests at Crane 29 will be able to enjoy the beautiful off-grid retreat by spending their time swinging in the indoor hammock and taking in the spectacular panoramic views of the harbor.